The beautiful Tulbagh valley was forever changed about 300 years ago when Dutch and Huguenot settlers were granted the right to settle land in the area now known as Tulbagh. Prior to this the valley is said to have been home to may of Africa's wild animals and to the San and Khoi people. Over time the valley developed as a trading post where timber, animal skins and even elephant husks were available for trade. At the same time many Cape Dutch, Edwardian and Victorian homes were built only to be destroyed by the earthquake of 1969. Many structures survived the earthquake and are still famously lining Church Street (Kerkstraat). Kerstraat is home to the largest collection of Cape Dutch, Edwardian and Victorian National Monuments on one street in South Africa. Church Street is a pleasure to slowly stroll along and read the history plaques adorning the various houses. You'll also find the tourist information office for Tulbagh on Church Street. The town itself is relatively small with a supermarket, bank, butcher, bottle store and other necessities available for that relaxing weekend away. 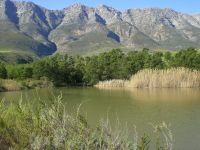 The Tulbagh valley is a nature lover's paradise with hiking, bird watching, mountain biking, horse riding, fishing and walking locations in plentiful supply. The various fruit, wine, livestock and grain farms set amongst the beautiful mountains make this little cute town a favourite getaway for locals and foreigners alike.